The Artivist Collective is pleased to announce the slate for the 7th Annual Artivist Film Festival including the festival’s opening film ReGeneration narrated by Ryan Gosling. This year's films span the globe, from the slums of Rio and Bangalore to the hemp fields of Humboldt and the Kenyan lands of the Massai. But far from being armchair travelogues, these films engage, inform, educate and entertain. The Artivist Collective is pleased to announce the slate for the 7th Annual Artivist Film Festival including the festival’s opening film ReGeneration narrated by Ryan Gosling and featuring Sound Tribe Sector 9, Tucker Carlson, Noam Chomsky, Amy Goodman, Talib Kweli, Norman Ornstein, and Howard Zinn, among others. This year’s festival will take place December 1-4 at the historic Egyptian Theatre in Hollywood, home of the American Cinematheque, screening over 45 independent, narratives, documentaries, shorts, and experimental films from around the globe. The festival concludes with The 2010 Artivist Awards on Saturday, December 4. The festival’s mission is to strengthen the voice of advocate artists - "Artivists" - while raising public awareness for global causes. Indeed, through the films and the presence of diverse NGOs active in human rights, animal advocacy, and environmentalism at Artivist, the festival presents a unique opportunity for filmgoers to gain both awareness of issues and become active participants in positive change. Artivist is the first film festival dedicated to addressing International Human Rights, Children's Advocacy, Environmental Preservation, and Animal Advocacy. At the conclusion of the Film Festival, Artivist awards a feature and short in each of these four categories. The Artivist Awards also honor those artists whose exemplary work in their community stands out as a shining example of one person's ability to change the world for the better. Past Artivist Award recipients include: Olivia Wilde, Hank Azaria, Ted Danson, Alyssa Milano, Joaquin Phoenix, Matthew McConaughey, Mira Sorvino, James Cromwell, Ed Begley Jr, Tippi Hedren, and Mike Farrell. The Artivist Awards have also paid tribute to such highly regarded international organizations as Amnesty International, the Humane Society of the United States, Global Green, Greenpeace, Prevent Child Abuse America, and the Child Welfare League of America. Since its inception in 2004, the Artivist Film Festival has showcased over 400 films representing more than 60 countries around the world. Artivist has reached millions of people with its film festivals in Hollywood, New York, London, Tokyo, Mexico City, and Lisbon, and through its website at http://www.Artivist.com. Additionally, in recognition of the socially conscious platform it provides, Artivist has been endorsed by Claes Nobel of the Nobel Prize family, Amnesty International, and the United Nations Department of Public Information. Many films that have premiered at Artivist have gone on to great acclaim including Academy Award winner Born Into Brothels, Academy Award Nominees Super-Size Me and God Sleeps in Rwanda, and the Los Angeles Premieres of Fast Food Nation, Emmanuelle's Gift, Stolen Childhoods, Zeitgeist, Zeitgest Addendum and Trudell. This year Artivist is proud to provide the community its “Artivist Stimulus Package” of free tickets for all festival film screenings. Festival goers can order two tickets for each screening at http://www.Artivist.com or at the Egyptian Theater box office during the festival. 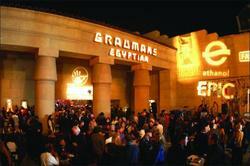 Artivist shows films in both theaters at the Egyptian. This year several films in the intimate Spielberg Theater deal with environmental topics. These include Water on the Table a character-driven, social-issue documentary that explores Canada's relationship to its freshwater; Deep Green, the first documentary devoted exclusively to showing us how to get off of fossil fuels; and Campesinos...We Will Inherit the Earth follows three children who live and work in sustainable agricultural cooperatives in Central America. Philip Montgomery’s feature documentary film ReGeneration takes an uncompromising look at the issues facing today’s youth and young adults, and the influences that perpetuate our culture’s apathetic approach to social and political causes. Focused on how today’s education, parenting, and media can shape us, the film follows three stories each with a unique perspective – from an inspired collective of musicians working outside the corporate system, to a twenty-something conservative family about to welcome the birth of their second child, and a group of five high-school students from the suburbs looking for their place in society. Their stories are interspersed with the knowledge, wisdom, and personal reflections of some of the country’s leading scholars, social activists, and media personalities, including Andrew Bacevich, Noam Chomsky, Talib Kweli, and the late Howard Zinn, among others. With such a varied and intelligent group of interviews, viewers come to a deeper understanding of the numerous influences shaping today’s culture where one universal feeling is shared – our society is at a crossroads, economically, environmentally, and intellectually – and we must change ourselves and the world for the better. While California is going bankrupt, one business is booming. How Weed Won the West is the story of the growing medical cannabis/marijuana industry in the greater Los Angeles area, with over 700 dispensaries doling out the buds. As a treatment for conditions ranging from cancer and AIDS, to anxiety, ADHD, and insomnia, cannabis is quickly proving itself as a healthier natural alternative to many prescription drugs. Following the story of Organica, a collective owned by Jeff Joseph that was raided by the DEA in August of '09, the film shows that although some things have changed with Obama in office, the War on Drugs is nowhere near over. From Kevin Booth, the producer/director of Showtime's American Drug War, How Weed Won the West puts California forward as an example to the rest of the country by documenting how legalizing marijuana can help save the economy. War Don Don (War is Over) is a Rashomon-esque legal documentary of global importance, a thought provoking film that engages the heart, mind and conscience. In Freetown, the capital of Sierra Leone, United Nations soldiers guard a heavily fortified building known as the 'special court.' Inside, Issa Sesay awaits his trial. Prosecutors say Sesay is a war criminal, guilty of crimes against humanity. His defenders say he is a reluctant fighter who protected civilians and played a crucial role in bringing peace. Directed by Rebecca Richman Cohen, War Don Don tells the story of a sensational trial with unprecedented access to prosecutors, defense attorneys, victims, and from behind bars, Sesay himself. In Krio, war don don means 'the war is over,' as today, thankfully, Sierra Leone is at peace. Can the trial of one man uncover the truth of a traumatic past? Artivist is pleased to be hosting a special screening for students and teachers of the Los Angeles Unified School District of the film Climate Refugees, which examines the new phenomenon in the global arena – people displaced by climatically induced environmental disasters. Such disasters result from incremental and rapid ecological change, resulting in increased droughts, desertification, sea level rise, and the more frequent occurrence of extreme weather events such as hurricanes, cyclones, fires, mass flooding and tornadoes. All of this is causing mass global migration and border conflicts. For the first time, the Pentagon now considers climate change a national security risk and the term climate war is being talked about in Washington D.C. Climate Refugees was produced by Stephen Nemeth, a noted producer of documentaries and features (Fear and Loathing in Las Vegas, Why Do Fools Fall in Love, Dogtown and Z Boys, War/Dance, Fuel and Flow, many others) who was the recipient of last year’s Artivist Award. This lively documentary directed by Michael Henning, begins with the arrest of Woody Harrelson for planting four feral hemp seeds in Kentucky and his subsequent trial and acquittal, then joins traveling Hemp activist Craig Lee and a number of featured old-school Kentucky tobacco farmers who just want to grow the multipurpose crop as a way to save their farms. Viewers meet Alex White Plume, leader of the Lakota “Tiospaye” (family clan), and the first family to plant industrial hemp on American soil since the 19502s. He makes a startling case that his right to grow hemp is a sovereignty issue. Julia Butterfly Hill goes to extreme lengths to protest the pulping of old-growth forests by living for over two years at the top of a 1,000 year old redwood tree in Northern California. Gatewood Galbraith, the fiery orator of the US Reform Party, attempts to bring to the public at large to its senses in his own inimitable style. A hyper-paced ride with a sizzling soundtrack, this motion picture puts hemp at the heart of just about every grassroots issue in America today. Featured players include Willie Nelson, Merle Haggard, Ralph Nader and Woody Harrelson. More than a political study of cannabis, Hempsters is a rousing portrait of our country’s most spirited and sensible free-thinkers. At a time when children spend more time in the virtual world than the natural world, Play Again unplugs a group of media savvy teens and takes them on their first wilderness adventure, documenting the wonder that comes from time spent in nature and inspiring action for a sustainable future. One generation from now most people in the U.S. will have spent more time in the virtual world than in nature. New media technologies have improved our lives in countless ways. Information now appears with a click. Overseas friends are part of our daily lives. And even grandma loves Wii. But what are we missing when we are behind screens? And how will this impact our children, our society, and eventually, our planet? At a time when children play more behind screens than outside, Play Again explores the changing balance between the virtual and natural worlds. Is our connection to nature disappearing down the digital rabbit hole? This documentary follows six teenagers who, like the “average American child,” spend five to fifteen hours a day behind screens. Play Again unplugs these teens and takes them on their first wilderness adventure – no electricity, no cell phones, no virtual reality. Through the voices of children and leading experts including journalist Richard Louv, sociologist Juliet Schor, environmental writer Bill McKibben, educators Diane Levin and Nancy Carlsson-Paige, neuroscientist Gary Small, parks advocate Charles Jordan, and geneticist David Suzuki, Play Again investigates the consequences of a childhood removed from nature and encourages action for a sustainable future.The soundtrack includes music from well-known Icelandic band Sigur Ros and singer Kimya Dawson (JUNO soundtrack). The music director is Andreas Hessen-Schei, of the Norwegian bands Jaga Jazzist and Shining. Maasai at Crossroads chronicles the struggles of the Maasai tribe as they attempt to modernize while maintaining their traditional culture. They realize that in order for their children to survive they must be educated, to this end they work with the non-profit organization, Africa Schools of Kenya (ASK). ASK is an educational curriculum that introduced experts in various areas to the Massai tribe - deeply influencing the worldview of the students, as well as the adults and elders. The external factors forcing the Maasai to modernize are the current drought and the encroaching influence of civilization. Directed by Joe Dietsch and Kristin Jordan the film poses several questions such as: What elements of any culture are important? What should be preserved and what can be left behind? How can cultures integrate modernization while remaining stewards of their traditions? And why is this so important? Maasai at the Crossroads explores a community’s efforts to come together, not only to survive, but to preserve cherished traditions as they learn how to thrive in the 21st century. This year, Artivist proudly welcomes back PETROBRAS as its Official Community Partner. For the past four years Petrobras has supported the efforts and expansion of the Artivist Film Festival. Understanding the interdependence between humanity, animals, and the environment is crucial in our global community. By working with individuals and groups, organizations and companies, we can create long-term solutions to our global problems.